After more than 9 months of design and development, and even longer preparing, we are happy to announce that today we are shipping the first tablet e-commerce store on the Highstreet platform. 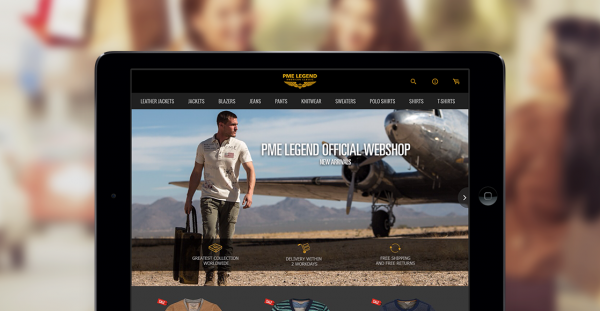 PME Legend, a well known fashion brand in The Netherlands, Belgium and Germany, is the first brand that will use Highstreet to release their own branded e-commerce app for iPad. Over the next month several other brands will follow. Highstreet 1.0 is the first step in our vision to help shape the future of e-commerce. A future in which online shopping becomes much simpler, more inspirational and a lot more fun. The introduction of the iPad in 2010 finally brought us a computing device that makes using digital media more initimate and more relaxing. The iPad allowed us to finally move from lean forward to lean back. Rather than sitting in front of a desk using mouse and keyboard, we got to enjoy digital experiences from the comfort of our couch using our fingers. Back in 2010, e-commerce was one of the first things on our mind when we thought of businesses that could benefit from tablets and the wonderful, engaging user experience they can offer. Today, over 30% of traffic of all Dutch fashion sites we visited over the last months, is coming from tablets. That is why it is time to take the tablet e-commerce experience seriously. The overall experience, on most webshops, is very slow. Even on fast webshops everything takes a long time because each product is loaded on a separate page. For every action users take, there is a slight delay while the browser waits for the server. Easily browsing a set of products takes a long time and is rather tedious to do. This makes leisurely discovering what is on offer across different product categories difficult. Product pages are typically, for a large part not about the product. Usually, only 40% — or less- of the screen is devoted to the product image. This is rather strange when you think about it: when you visit a fashion store you first look at the the clothing and only later at the label. Webshops use webpages and these render content. This is the positioning of different elements on the page after they are returned from the server. Unfortunately, this behaviour is exposed to the user and creates a stuttering effect while they wait for the page to be ready. Most people won’t even realize this as they’re so used to it. But it creates noise that makes the experience feel ‘technical.’ When you show users an experience where browsing is a smooth and seamless experience, they’ll love that. We think that online shopping on tablets should be simple, inspirational and delightful. To make that happen we need a user experience that is very fast, put’s the product in the spotlight and makes browsing the catalog smooth and seamless. To create this experience, we decided to go native first. By designing for a native app we could design for the most advanced technology available today. It also forced us to have a truly fresh view as we were not limited by existing e-commerce conventions and limitations. For the first version of Highstreet we focussed on getting the core catalog right. We have ideas and plans for many exciting features but they all rely on a powerful catalog experience underneath. We therefore made browsing and navigating the catalog our first priority. Viewing multiple products on most webshops is typically a back and forward affair: you go to the category, tap on a product to view it. Tap back and select another. We wanted to make this much simpler. With Highstreet users go to the product and from there swipe to the next product. This is very fast and works on any level — in full screen product mode but also in a more detailed product information. From the start of the Highstreet project, optimizing for speed and performance has been one of the most dominant themes. Every aspect of the experience benefits from speediness. And it is speed that makes discovery and leisurely navigating the catalog possible and enjoyable. Filters feel like a rather technical feature in most webshops. Long lists with checkboxes that are often hard to select with your fingers. For Highstreet we spent a lot of time designing and iterating important features like this. The result is a simple and not overwhelming choice of filters that is easy to apply and to undo. There are many more finer and bigger details to the Highstreet experience. For this I invite you to download the PME Legend app as soon as it becomes available in the next weeks or check highstreetapp.com. There is more to Highstreet than what you’ll find in the App Store. We believe that brands that use our platform should not need to maintain products specifically for the app. That is why Highstreet is fully integrated with the Magento e-commerce platform and we spent a lot of time getting that right. Brands manage their product catalog in Magento and just as their webshop displays their catalog, Highstreet does the same. We took this integration far: each attribute, price, offer, stock etcetera is fully integrated into our app. This allows us to recreate the full e-commerce experience and not just offer a polished product feed app with no true e-commerce capability. Tablets play a central role in our vision right now. So at the start, Highstreet is a tablet platform. We focus on iPad because right now this device is by far leading the tablet commerce market. However we are not tied to specific devices or platforms. What drives and leads us, is the user experience that we are after. Any viable e-commerce device or platform that allows us to realize this experience, represents a potential direction for the future. It may be clear that after our initial launch, we are not done. Highstreet 1.0 lays the foundation on top of which we will continue building. We are very serious about creating the e-commerce user experience of the future. There is a lot of potential to provide other functionality and content that helps us to accomplish that. Over the next weeks, months and years, we will keep working on Highstreet and the true lean back e-commerce experience. We empower brands to get in the pocket of their customers by putting mobile at the heart of the shopping experience.